Let us rejoice, children of Christ and children of the Church! For her Bridegroom is raised from the dead, and with his Resurrection he raises us, his children and hers, to the symphony of heaven! Alleluia! Our antiphon today completes the journey we started with the antiphon, O virgo Ecclesia, earlier this week. 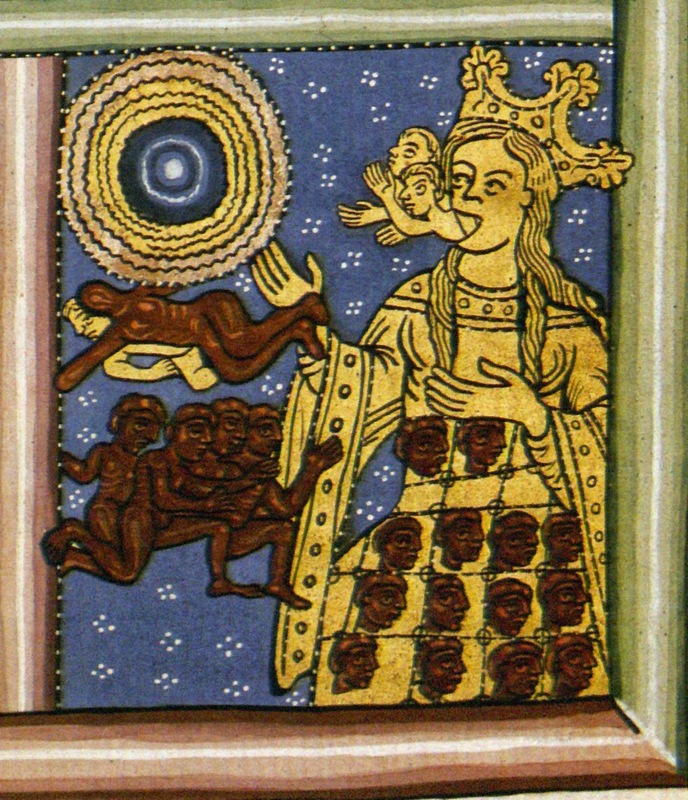 In that piece, Ecclesia’s garments were rent and her children torn from her side by the invidious plots of the serpent, whose vicious guts (in visceribus suis), producing only the harsh bile of sin, are in today’s antiphon contrasted with the Church’s life-giving womb (materna viscera). We had entered into the mournful, painful silence imposed by the interdict of Christ’s death—the wasteland of grief, of light snuffed out, of voices choked. But today, the bells ring out and our voices reecho with their clarion call. Christ is Risen! Alleluia! 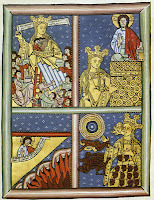 Rupertsberg MS, fol. 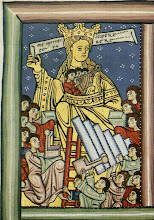 41v (detail). And you see a serene human coming forth from this radiant dawn, Who pours out His brightness into the darkness; and it drives Him back with great force, so that He pours out the redness of blood and whiteness of pallor into it, and strikes the darkness such a strong blow that the person who is lying in it is touched by Him, takes on a shining appearance, and walks out of it upright. This is the Word of God, imperishably incarnate in the purity of unstained virginity and born without pain, and yet not separated from the Father. How? While the Son of God was being born in the world from a mother, He was still in Heaven in the Father; and at this the angels suddenly trembled and sang the sweetest praises of rejoicing. And, living in the world without stain of sin, He sent out into the darkness of unbelief His clear and blessed teachings and salvation; but, rejected by the unbelieving people and led to His passion, He poured out his beautiful blood and knew in His body the darkness of death. And thus conquering the Devil, he delivered from Hell his elect, who were held prostrate there, and by His redeeming touch brought them back to the inheritance they had lost in Adam. As they were returning to their inheritance, timbrels and harps and all kinds of music burst forth, because humankind, who had lain in perdition but now stood upright in blessedness, had been freed by heavenly power and escaped from death. When we consider these things carefully, we recall that humankind needed the voice of the living Spirit, but Adam lost this divine voice through disobedience. For while he was still innocent, before his transgression, his voice blended fully with the voices of the angels in their praise of God. Angels are called spirits from that Spirit which is God, and thus they have such voices by virtue of their spiritual nature. But Adam lost that angelic voice which he had in paradise. Consider, too, that just as the body of Jesus Christ was born of the purity of the Virgin Mary by the Holy Spirit, so, too, the canticle of praise, reflecting celestial harmony, is rooted in the Church through the Holy Spirit. The body is the vestment of the spirit, which has a living voice, and so it is proper for the body, in harmony with the soul, to use its voice to sing praises to God. And on [Ecclesia’s] breast shines a red glow like the dawn; for the virginity of the Most Blessed Virgin when she brought forth the Son of God glows with the most ardent devotion in the hearts of the faithful. And you hear a sound of all kinds of music singing around her, “Like the dawn, greatly sparkling” [quasi aurora valde rutilans]; for, as you are now given to understand, all believers should join with their whole wills in celebrating the virginity of that spotless Virgin in the Church. 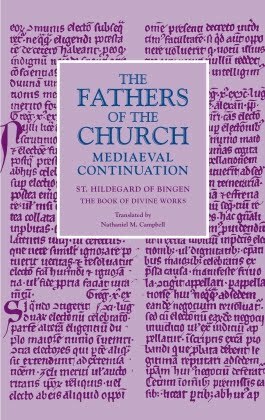 And thus the Church is the virginal mother of all Christians, since by the mystery of the Holy Spirit she conceives and bears them, offering them to God so that they are called the children of God. 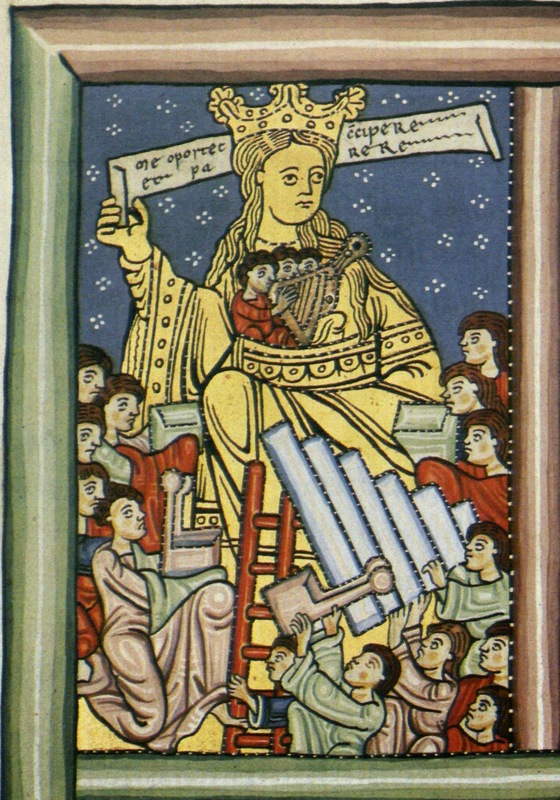 And as the Holy Spirit overshadowed the Blessed Mother, so that she miraculously conceived and painlessly bore the Son of God and yet remained a Virgin, so does the Holy Spirit illumine the Church, happy mother of believers, so that without corruption she conceives and bears children naturally, yet remains a virgin. Scivias II.3: The Church and Baptism. 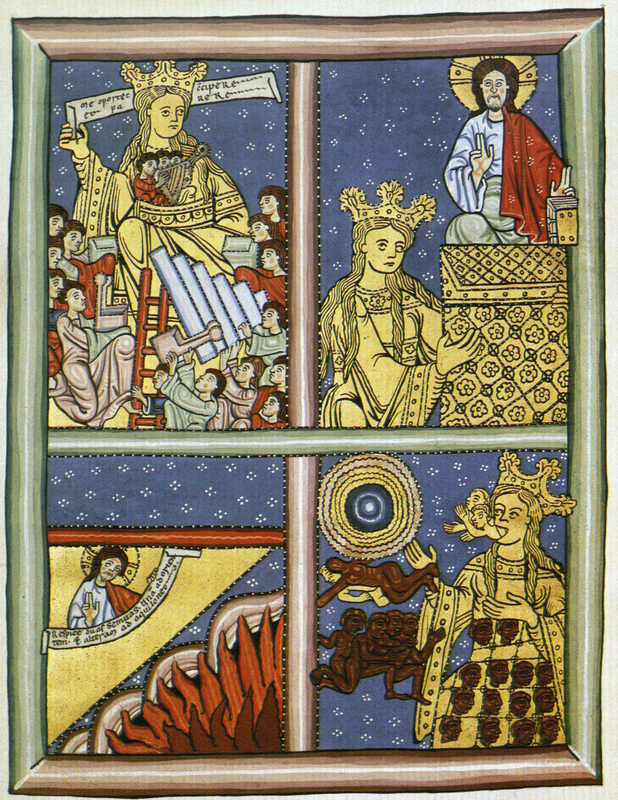 Rupertsberg MS, fol. 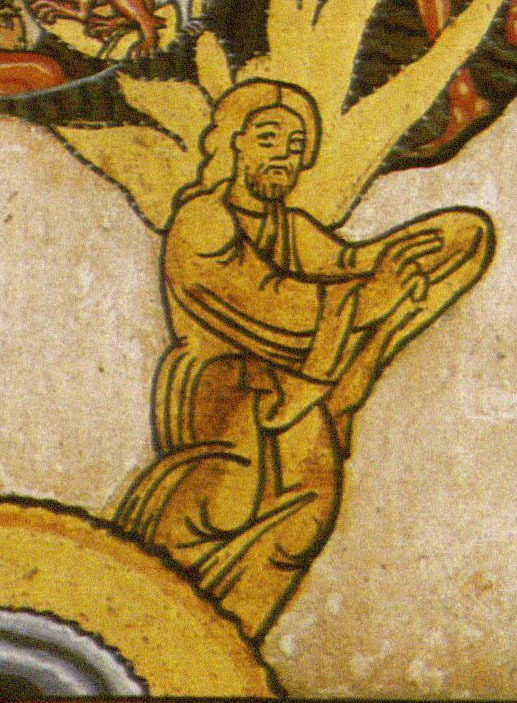 51r (detail). For the Divine Power, looking into human hearts, mercifully takes from them the crimes of their unbelief by the washing of baptism, and throws those crimes out of their Way, Which is Christ; for in Christ there is no death, but life through pure confession and washing away of sins. Through Him each of them is clothed in the purity of salvation, and through Him the brightness of the blessed inheritance, from which the first human being was expelled, is opened to them. And each of the faithful is admonished by words of truth that they should lay aside the old ways of iniquity and accept the new gift of grace for salvation. 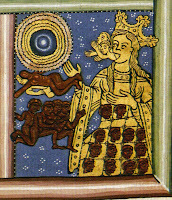 And the children who have passed through the womb of the image [of Ecclesia] walk in the splendor that surrounds her; which means that they, who through the font of sacred baptism have the Church as their happy mother, should remain in and keep to the divine law by which their mother is illuminated and adorned.